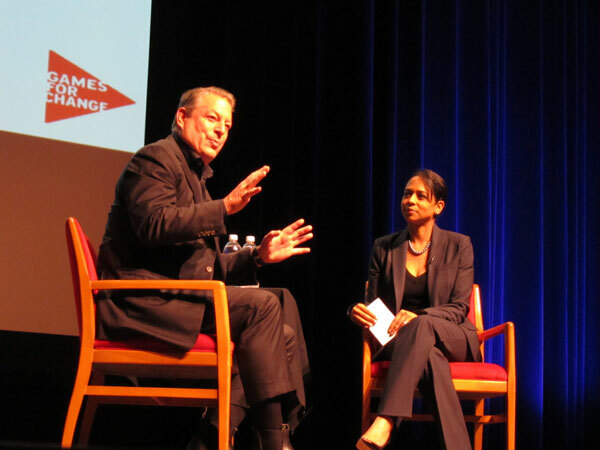 On the first day of the 8th Annual Games for Change Festival in New York, there was one question on everyone's mind: "What's Al Gore going to say at a gaming conference?" Maybe he will announce a game on climate change? Imagine saving "climate refugees" from the island of Maldives and ferrying them to a nearby Sri Lanka before anyone starts to drown. Or imagine nations competing with one another for precious carbon credits by deploying the military to retrofit entire cities. Alas, the news wasn't that earth shattering. When the former vice president took the stage to give the opening keynote, he simply wanted to say to game developers: "You have my attention." His exact words: "Games are the new normal." This is due in no small part to the popularity of smart mobile devices, including iPhones and iPads from Apple, a company on whose board he sits. Facebook deserves credit too for building a platform on which social games can be deployed and spread quickly. But even "gamfication" -- the use of game mechanics for non-game uses -- is now ubiquitous. Businesses of all sizes see potential in making their products more addictive (or engaging) to their customers and have invested accordingly in integrating game mechanics. The social sector, as usual, is lagging behind. Al Gore admits that he and his team at the Alliance for Climate Protection have had numerous discussions on how to use games and are determined to do something. So what's holding him back? He hinted at one answer: good games are not so easy to pull off. You can't add points and badges and then stir and mix and expect to have a hit. "Mechanics can matter," says Gore, "but it's about the WOW moments, the fist-pump moments, the lean-into-the-screen moments." I believe there's a bigger, unstated, reason at play. It has to do with impact. Can a game on climate change really produce the real life results we need to see to turn things around? Gore, I assume, is not yet convinced, despite gaming's popularity. His hesitation is understandable. The field of "serious games" is still new, not mature enough to provide rock solid proof that games can have profound and sustained social impact. This open question is why the conference spent the entire first day on making "The Case for Social Impact Games" by presenting a series of case studies. They included iCivics, an effort by former Supreme Court Justice Sandra Day O'Connor to use games to teach civics, and EVOKE, a game funded by the World Bank Institute to teach African youth the skills and abilities to change the world. iCivics has seen two million plays and EVOKE was played by 20,000 users. But learning and social outcomes are much trickier to track, let alone quantify. The sessions' content reflected that challenge. The crowd favorite seemed to be Macon Money, an experiment by the Knight Foundation to use a real life social game, designed around a new currency, to build stronger social ties in Macon, Georgia. This is how it worked: some lucky residents in Macon received half a bond each and were instructed to find others whose half bonds match theirs. Together they have to show up at game headquarters to redeem the bonds for real cash in a special currency. The Macon Money is then spent on local businesses, benefiting the local economy. The fact that the game is played in real life probably helped make its impact more visible to the audience. Photos of smiling residents holding up their matching bonds also spoke volumes. The Knight Foundation has hired two firms to evaluate the game to see if it produced changes in knowledge, attitude and behavior of the residents and whether the newly formed connections lasted. A full report will be released in August. The case for social impact games -- virtual and real -- is one that many social innovators are desperate to make. They've seen the limits of knowledge and reason in changing human behavior -- to exercise, eat healthy, recycle, and reduce one's carbon footprint. They need other ways to motivate people to "do the right thing." This is the main reason I'm exploring gamification as well, with a new social innovation competition called Fun for A Change. I'm engaging youth in several countries in designing fun solutions to our common challenges to see if we can improve results... for people and for our planet. I've already kicked off a pilot at Simon Fraser University in Canada and will spread it to other universities in the U.S. and India in the Fall. I'm trying to see whether solutions powered by game mechanics can engage youth to change behavior and to become changemakers themselves. If that can happen, then maybe saving the world can be fun too (for a change).